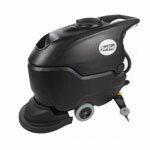 This microfiber carpet bonnet is great for scrubbing carpets, or cleaning hard wood floors. Also works great on commercially tiled floors. If you were to use a normal scrub pad on a floor, and then come across with this ficrofiber bonnet, and you would be amazed as to how much dirty the first pad missed. High absorbent, launderable, microfiber carpet bonnet.